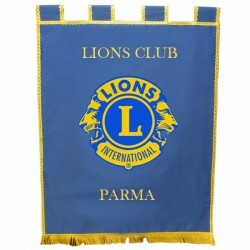 Labarum and pennants for your association. LIONS CLUB There are 5 products. Lions or Leo Club pennants, with golden edge and fringe. Single-sided printing. Lions or Leo Club pennants are digitally printed front / back, packed with beaded fringe and gold.